Mexican chocolate is so decadent that I dream of it at night! I wake up in the morning and think – “I have an idea of what and how to make a new dish with Mexican chocolate!” This dish was inspired by one of those dreamy chocolate moments. This dessert is almost like ice cream but lighter. It is “semifrozen” when serving, hence the “semifreddo” name. This works well when entertaining a sit down meal. It will serve between 8 and 10 depending on how you slice it. Instead of putting the mixture in a rectangular shape you can opt for individual serving dishes. Make one for each guest and save the rest for later. In medium sized sauce pan heat tabilla, coconut milk and semi sweet morsels over low heat. Whisk constantly to blend and to prevent from burning. Pour all contents into mixing bowl and add champagne. Mix together and immediately transfer to a deep rectangular shaped container (8“x 4” and 4” deep) that has been lined with parchment paper. Place into freezer and freeze for at least 6 hours. This can be made a day ahead. Cut strawberries in a decorative fashion or just slice and set aside for plating. When ready to serve, heat half of a tabilla and the semi sweet morsels in a double boiler and mix until melted. If you don’t have a double boiler, take a mixing bowl and place it over a larger pot with water in it and melt chocolate over medium high heat. Pour melted chocolate into a squirt bottle or Ziploc bag. Remove semifreddo from freezer and place into a larger baking dish with hot water to help make it easy to remove from container. It should only take 30 seconds to a 1 minute. Once loosened use the parchment paper to lift it form its container. 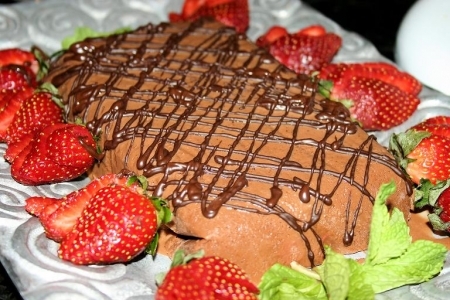 Flip it onto a serving dish and decorate with melted chocolate from squirt bottle add strawberries and mint. Freixenet Brut sparkling wine that was used to make the dish or your favorite sparkling wine or Kahlúa & Coffee.